..... Click the link for more information. ), are hemispherical masses of earth raised on a base and faced with brick or stone. The structure is surrounded by a processional path, the whole being enclosed by a stone railing and topped by a balcony. Though in its development the stupa often became elaborate and complex, in its purest form the plan consisted of a circle within a square. Many of the most significant monuments of the Buddhist world are stupas, and they can be found in every country in which Buddhism has been practiced. Some examples are the Thuparama dagoba (244 B.C.) in Sri Lanka, Borobudur in Java (8th or 9th cent. A.D.), and the Mingalazedi stupa in Myanmar (A.D. 1274). In East Asian Buddhist architecture, the function of the stupa has been taken over by the pagoda. A Buddhist memorial site, consisting of an artificial mound on a platform, surrounded by an outer ambulatory with four gateways, and crowned by a multiple sunshade, erected to enshrine a relic. Stupas such as the famous Pha That Luang (or Pha Chedi Lokajulamani) in Laos, contain relics of buddhas and serve as important holy sites in Buddhist cultures. AFP/Getty Images. In Buddhist culture, a stupa (in Tibetan, a chorten) is a shrine to the dead. Their origins can be traced to prehistoric times, when they were simple mounds where important people were buried. As Gautama Buddha (the founding figure in Buddhism) approached the end of his earthly life, he requested that his remains (cremation being the common mode of disposing of bodies at the time) be placed in a stupa. At the same time, herequested that people change their thinking about stupas. Rather than being merely a place to remember the dead, a stupa should be seen as a symbol of the enlightened mind. From that time on, the stupa evolved into its present complexity. Traditionally, the stupa is a hemisphere topped with a square shape. Above the square is an umbrella-shaped cone with a pointed top. The stupa represents the body of a buddha (an enlightened individual, but not necessarily Gautama Buddha) and should call to mind the buddha’s presence in physical form. The base represents his throne; the four steps symbolize his legs crossed in the lotus position; the dome signifies his torso, with the square specifically standing for his eyes (and in some cultures they have eyes drawn on them); and the spire is his crown. Contemplating stupas over the years has allowed for the development of a rather elaborate correspondence between different parts of the stupa and Buddhist teachings. Within it, every stupa contains a life tree and holy relics. The central pillar in the midst of the stupa corresponds with the world tree, which in Indian mythology united heaven and earth. As the stupa evolved, the monument became a pivotal place, an axis around which believers moved like the planets traveling through the universe. It is also likened to the human spinal cord. The relics placed inside a stupa may be as simple as a few bones that survive a cremation or items that belonged to the person, or as elaborateas the mummified body of an especially important person. (The earliest Buddhist stupas were built to house relics of Gautama Buddha.) For example, the mummified remains of many of the Dalai Lamas were placed within stupas that rest inside the Potala, in Llasa, Tibet. Also inside the stupa one might place copies of Buddhist scriptures, prayers or mantras, statues of Buddha, or clay tablets called tsha-tsha, which have various symbols on them. Stupas are widespread throughout southern Asia. In Sri Lanka they are known as dagobas. In China and Japan, they evolved into the pagoda. The largest stupa in the world is Borobudur, an Indonesian temple complex near Yogyakarta, Java, that incorporates many small stupas surrounding a large main stupa at the temple’s highest point. Stupas reached the epitome of their development in Tibet, and in the last generation the scattered Tibetan community has erected stupas around the world. In the West, the construction and dedication of a stupa has often become a significant event in the development of a Buddhist center, signifying its having attained a certain level of stability. Such stupas may be erected upon the death of a movement’s founder (and hence contain his or her relics); however, they may be constructed in a more general context and contain relics related to famous Buddhists contributed by older centers. A believer generally shows respect when visiting a stupa/chorten by walking around it clockwise so that the right arm is closest to it. Cummings, Joe, and Bill Wassman. Buddhist Stupas in Asia: The Shape of Perfection. Oakland, CA: Lonely Planet Publications, 2001. Pant, Sushila. Origin and Development of Stupa Architecture in India. Columbia, MO: South Asia Books, 1977. Snodgrass, Adrian. 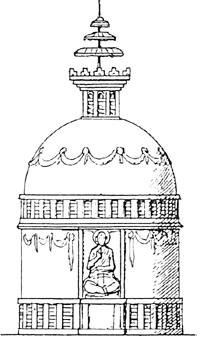 Symbolism of the Stupa. 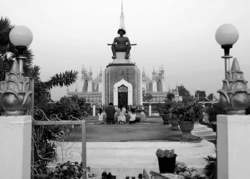 Delhi: Motilal Banarsidass, 1992.
in Buddhist architecture, a large structure used as a reliquary. The earliest stupas, such as the Great Stupa at Sanchi (third and second century B.C. ), already had a standardized three-part structure: a terraced foundation, a central mound, and a superstructure in the shape of a multitiered umbrella crowning the mound. Stupas may be hemispheric (India, Sri Lanka), square and terraced (Sri Lanka, Thailand), tower-shaped (Vietnam, China), bell-shaped (Burma, Thailand, Cambodia, Indonesia), or bulb-shaped (Mongolia, China). Stupas are usually faced with stone or plastered bricks with a filler of earth or gravel; they are often painted and gilded. The term “stupa” is used only in India and Nepal; in Sri Lanka the corresponding term is dagoba, in Burma zedi and pato, in Thailand chedi and prann, in Laos that, in Mongolia suburgan, and in China and Vietnam pao t’a and pagoda. A Buddhist memorial mound, erected to enshrine a relic or to commemorate a sacred site; consists of an artificial mound, raised on a platform and surrounded by an outer ambulatory with a stone railing and four gateways, crowned by a multiple sunshade. He added that concept of Ice Stupa is based on the idea of Iceman of Ladakh Chhewang Norphel who made artificial glaciers in Nang village. The Cross-shape stupa that is considered to be the biggest one was discovered during the excavation conducted by John Marshall. From high above we admired a green landscape studded with stupas. An effort to restore the Nangchen Stupa began in 2007, when Gyalwang Drukpa, who is based in Ladakh, visited Nangchen. As one goes around the ramparts, one is rewarded by an unobstructed view of all the 3,000 stupas and pagodas all around, each one suspended in a timeless tableau as old as the ages. Fue en esa ocasion cuando las reliquias llegaron por primera vez a Camboya desde Sri Lanka y se instalaron en la stupa frente a la estacion de ferrocarril. But the owners sold the land to the federal government in 1990 and left the stupa behind. A stupa is a traditional structure, similar in meaning to the cromlechs of this part of Wales. The stupa was rebuilt in the course of its history; there is the old anda (hemispherical dome), built of limestone and filled with rubble and earth, which sits on a drum base creating the lower medhi (terrace surrounding the dome). Harmarajika stupa (Taxila) and Butkarha (Swat) stupa at Jamal Garha were among the earliest stupas of Gandhara. Nesse sentido a leitura do stupa serve como uma ilustracao do potencial analitico promovido pelo intercambio entre as duas disciplinas e chama atencao para as vantagens que uma colaboracao aprofundada pode trazer para ambas as sociedades cientificas envolvidas. In many respects, Recalling a Buddha, when seen in its ideal form in theaters with a community, comes closer to being something like the votive stupa of the Buddhist traditions.